Our multifold partition systems consist of continuously hinged panels and are ideal for use when a ceiling head fixing is restricted or where rapid layout changes are required. 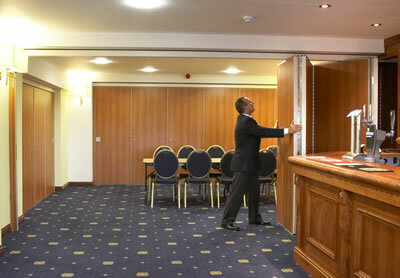 These folding partitions or doors work well in offices, especially those where hot desking is prevalent, hotel meeting and function rooms, plus other buildings in the leisure industry including clubs, restaurants and leisure centres. The quality of the panels and ease of operation combines the speed of a Fabric Concertina Partition with the quality and ‘permanent’ appearance of a Moveable Wall System. For advice on installing one of our Folding Partition Walls request a quote using our online form or call one of our team on 01373 454577. The acoustic seal at the floor and ceiling enables the partition to achieve a better sound performance than a fabric concertina partition and the easy operation and quality appearance make them suitable for almost any space from classrooms to boardrooms. Multifold hinged partitions comprise of linked panels which slide and fold. The panels can all park to one side of an opening or may be divided and parked to both sides of an opening. The panels are constructed with a solid particle board on an aluminium peripheral frame. The panels are then filled with mineral wool and other sound obstructing sheets. The hinged panel arrangement allows for a lead panel to be operated as a conventional pass door when the partition is in use. This is achieved without incurring additional cost. Parked panels may project to one side of the track run or may park centrally. The Multifold partition can be either Centrefolding (the centre of the panels are fixed to the track) or End-Folding (the end of the panels are fixed to the track). If the panels are End-Folding then the option of being floor supported requires a suitable structure for support. The maximum panel width is 850mm (Centrefolding) or 700mm (End-folding), the maximum height is 4000mm. The pass door can be fitted with a lock if required as an optional extra. Whilst often used as a floor mounted system in buildings where there isn’t a suitable supporting structure in the ceiling they can be manufactured as a top hung system if required. For more information on our Multifold partitions download the Technical Drawings and detailed Product Specification or contact our team on 01373 454577. The individual panels in our folding wall partitions have a normal thickness of 68mm with hard wearing seals at the top and bottom giving an acoustic level of 38dB – 45dB. 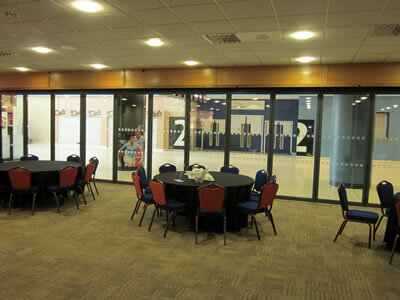 A range of vision panels are available giving partially glazed options to your multi-folding partition. To find out more about the range of colours and finishes available or to discuss your specific requirements in more detail call our team on 01373 454577. “As Estates and Facilities manager of a large Conference centre in Warwickshire, I have chosen Building Additions to install two folding partition walls. The most recent is a fully glazed 4 panel folding wall which allows me to have a dedicated Games / TV room with the ability to open up the space for a Disco / Band to play from. From the stage of the initial enquiry through to the completed install Building Additions have worked with me to make the choice from a wide range of doors and styles to answering all queries with regard to making good floors and ceilings either side of the track. Read our case study to see how our multi-folding partition helped Woodlands Gold Club in Bristol increase their revenue potential by giving them a flexible space they could use for weddings and other events.